A Gemini and Leo love compatibility together in a romantic relationship can be an exciting adventure for both people. Together a Gemini and Leo in love can make a great team. These two zodiac signs are both great at communicating, which is key to keeping any relationship strong and healthy. Like any relationship, this one has it’s ups and downs. Luckily, there are more good points than bad points. With a little bit of work, these two star signs are sure to be able to make things work with each other. In general, Gemini birthdays are intellectuals, and they will want to be with someone who can stimulate them mentally. If they can’t hold an adult conversation with their partner, then it is not likely that the compatibility will last for a very long time. Luckily, the Lion tends to be creative and dramatic with their thoughts, making way for plenty of stimulating and entertaining conversation, which is exactly what the Twin is looking for in a conversation. This is great actually because Gemini tends to become bored easily. Although, while Gemini likes to think out what they are going to do for a while before they actually get around to doing it, and Leo, on the other hand, tends to be impulsive with many of their decisions. This can be annoying in a Gemini Leo relationship at times, but it’s just the way that it is. Leo sees that there is little point to try to go about changing this Leo personality trait. They enjoy being impulsive. When Leo knows what they want they will be direct about it. They like to make their point clear so that they know that they will not be misunderstood. While they shouldn’t have to worry about this while they are with a Gemini personality, they still want to say what they are thinking, as they are thinking it. This may annoy the Twins at first, but they tend to be very understanding and will listen and the Lion speak their mind. Although, if the Gemini Leo soul mates two disagree on the topic then it is almost bound to be turned into a debate. Gemini love the mental stimulation about fighting for what they believe in, but emotionally they just don’t like to argue with someone who they care about. Leo is determined to get what they want when they really believe in something. They don’t want a Gemini trying to control their life, which is not likely to happen, but they worry about it nonetheless. Gemini on the other hand, is always worried about their independence being taken away. If their partner tries to restrict things, then the Gemini and Leo compatibility is not likely to work out. When a Gemini woman and Leo man friendship turns into love things should go well. There are several pros when it comes to this Gemini Leo couple. These two signs will have an easy time communicating with each other, which should make most of their romantic interactions rather simple to handle. The Leo man in love is charming and will have no problem winning over the Gemini woman if he really puts his mind to it. Leo are determined to get what they want, even if it is the love of the Twin. However, the Gemini female is clever and she will see his advances coming. Luckily, she likes a change of pace in her life and will take it well when the Leo male showers her in compliments. This will do a great deal to raise her self-esteem. In the Gemini and Leo love compatibility, the Lion also likes to be praised, although he won’t brag, and the Twin will be able to catch onto this trait quickly. There will not be much jealousy within this relationship, as they both need their space and they both can relate and understand this need for each other. This doesn’t mean that there is a lacking of faithfulness in the Gemini Leo marriage. While the Leo will take compliments from anyone who will give them to him, and he seeks attention from as many other as he can get it from, he will always stay loyal to a Gemini who he is in love with. The male Gemini dating Leo woman actually seems to be better than the opposite. They are likely to form a bond quickly, weather as friends or romantic partners. They are likely to be playful towards one another, which is why they can form a bond so easily. It will feel natural, like making friends in school. The Gemini Leo compatibility is wonderful when it comes to communicating with one another, which resolves many problems before there even is a problem. The Gemini man is smart and can easily stimulate the Leo woman’s mind. This is great because the Leo woman loves attention, and she will take great pleasure in even a simple conversation. She also loves to receive compliments, and this will not be hard for the Gemini to notice right away. He can also teach his woman how to relax when she becomes too overwhelmed with the world. She takes things too quickly in her life sometimes, so having a Gemini man by her side is a great way to keep her stress levels down. Once the Gemini Leo compatibility is set, they will be unconditionally faithful and loyal to each other. They both know that they don’t deserve to be lied to, so it is unlikely that either one of them would ever go behind the other’s back. This quality makes the relationship seem light and breezy. There is little room for jealousy in this relationship. Instead, the Gemini and Leo in bed will be attached to each other. They won’t be boring about it though. (Read about Leo sexual traits). They are likely to take adventures together and go on trips or buy each other lavish gifts. They love it when they can do something together, and they don’t have many qualms about spending money to have a good time. As affectionate as these two sun signs can be to each other, the Gemini Leo love compatibility still has some cons to it. Gemini women tend to be insecure, which is probably worsened by the Leo’s flair for seeking attention. While the Gemini doesn’t need to be showered in attention she would still prefer that her man does not look for attention from the wrong sorts of people. Leo men are not likely to notice the Gemini woman’s problems right away, which could cause him to become careless. These two signs are both rebellious in nature, which could easily cause problems within and outside of their relationship with each other. There is no doubt that the relationship between these signs will need to meet in the middle when it comes to many of their decisions and actions. The Gemini and Leo compatibility will need some effort from both members of the relationship if they are to make things work. There are some cons to this Gemini Leo love compatibility though. 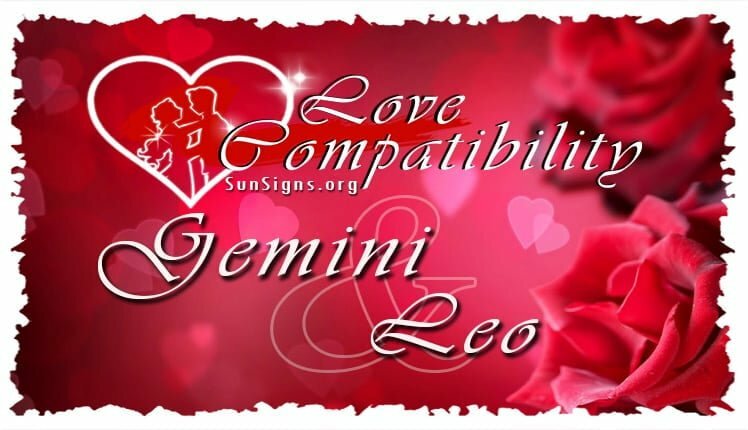 While the Gemini man is not usually possessive, the Leo woman will want to be in control of the relationship, which the Gemini man is not likely to love this idea. He wants to keep his freedom, and having a Leo female may bring him down sometimes. She will want to try to tame his more wild side, but he doesn’t want to be tamed. At times the Gemini male will play mind games to get what he wants, and this can be seen as a manipulative behavior which no woman will like. Then a Gemini Leo breakup becomes inevitable. Overall, a Gemini and Leo compatibility is good enough to have a loving relationship if they can learn to trust each other and make decisions together. Even if it doesn’t work out they are bound to stay friends. Sexually, Gemini and Leo may need some effort, but it’s worth the time and energy that both of the signs put into it.